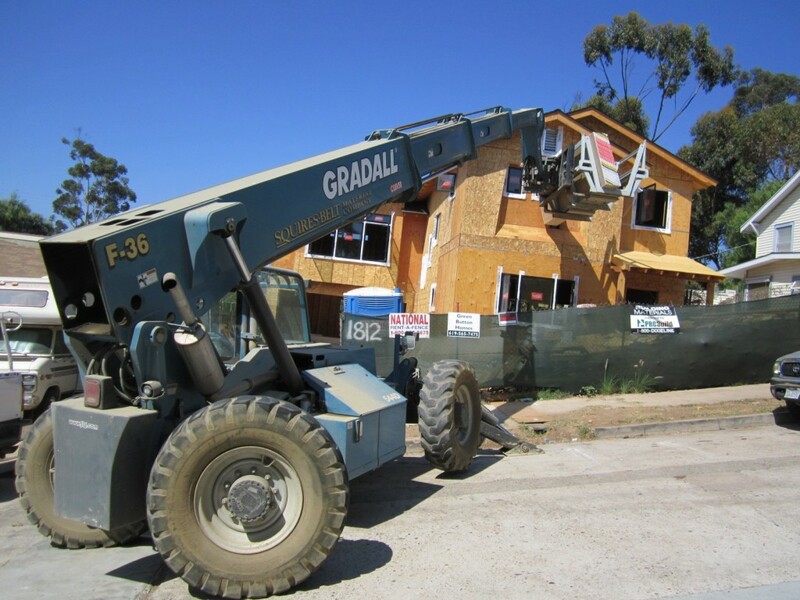 We have 2 great projects this Winter in the South Bay area of San Diego. These 2 projects in Chula Vista and Imperial Beach are within 7 miles of each other, so we should be able to stagger the subcontractors and do them both back-to-back. While the architecture is completely different on each, I’ve come up with some designs that I think will be a hit. House #1 will start within a few weeks in Chula Vista which is currently a 5 bedroom, 2 bath 1,600 s.f. 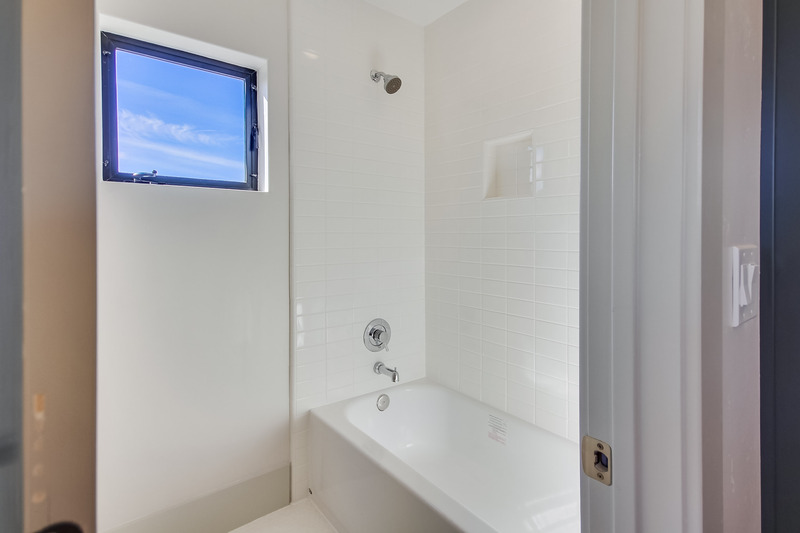 We’ll combine the smaller existing 2 bedrooms over the garage to create a large private master suite upstairs. Downstairs are the other 3 bedrooms, hall bath and a giant open concept living/dining room and kitchen area with a set of 10 foot sliders out to the back yard. 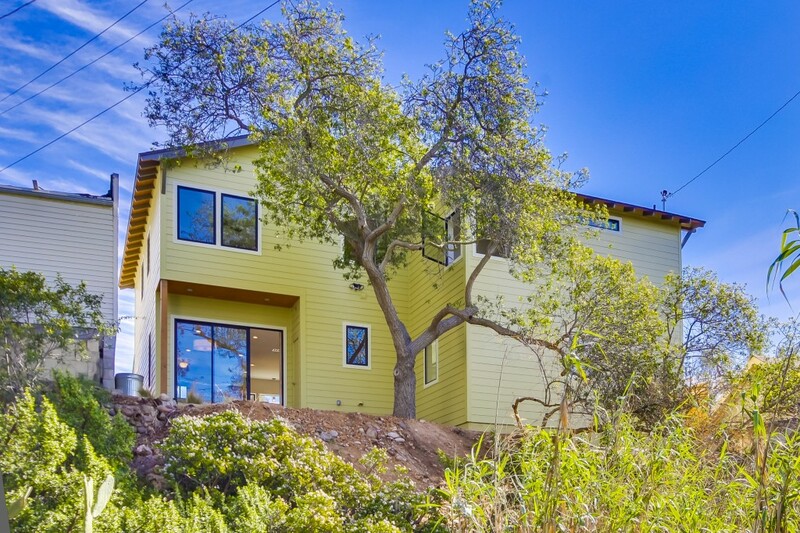 This house sits on a bluff and catches the westerly ocean breezes and has peek ocean and bay views. The street is great with all nice pride of ownership homes around. We bought this property directly from the original owners and its probably the last house on this block that hasn’t received a big remodel so I’m really looking forward to the transformation. 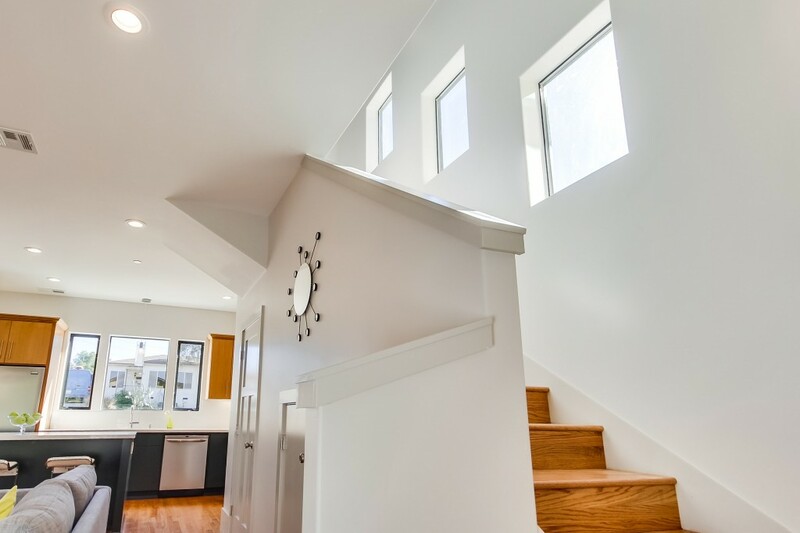 Here is a before and after of my Coastal Craftsman Design. Its amazing that with just a few very small changes like the shutters, pergola above the garage door, 4 knee braces at the eaves, and the new colors we see such a dramatic change. 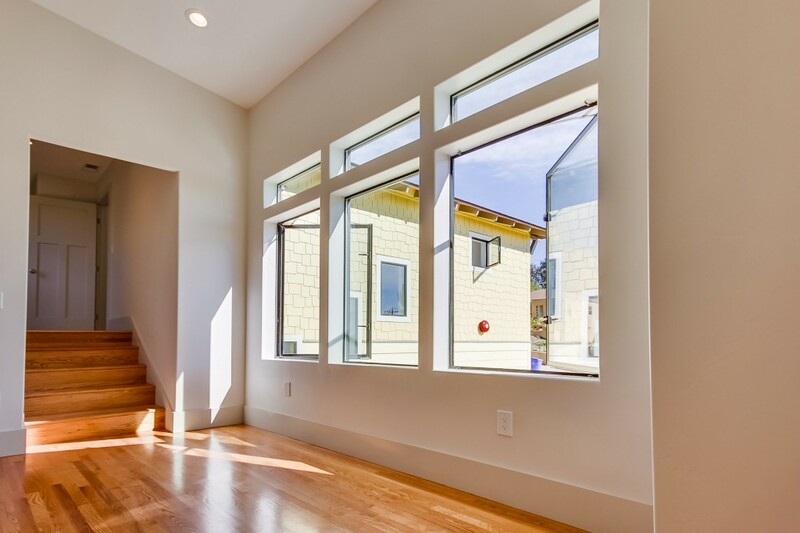 The grey body and bright white trim I think look good and do not conflict with any of the neighboring houses. The white garage door will complete the new-house look. 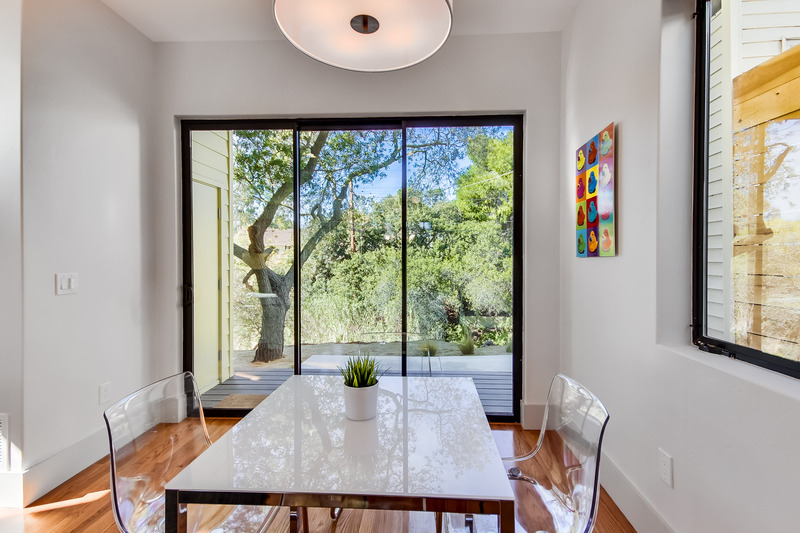 House #2 is a great Mid Century 3/2 1,265 s.f. 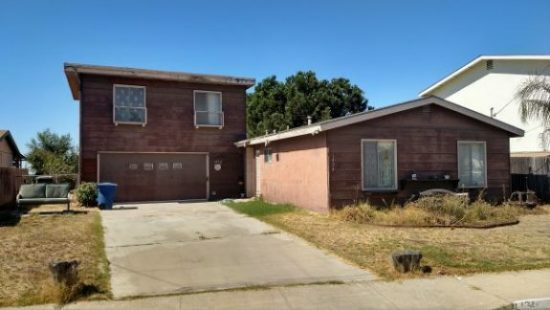 with a 2 Car Garage in the very popular “Seaside Point” Neighborhood of Imperial Beach. It is only 1 block to the Estuary and Imperial Beach is seeing a tremendous amount of redevelopment lately. It’s come a long way from the funky beach town we knew in the 80’s. There are mega shopping centers, a coastal rezoning plan, and tons of infill new construction going on along with the new Bikeway Village Project. 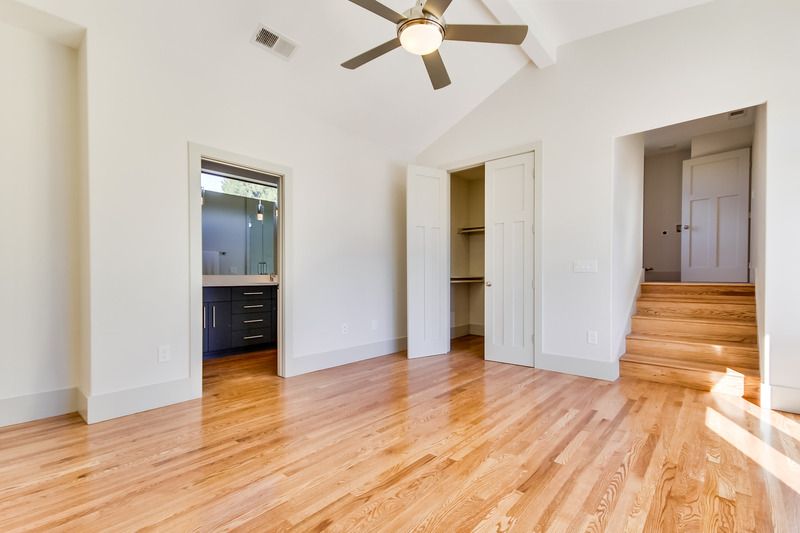 This property has a great floor plan already with vaulted ceilings, low sloping roof line, and an open concept kitchen. 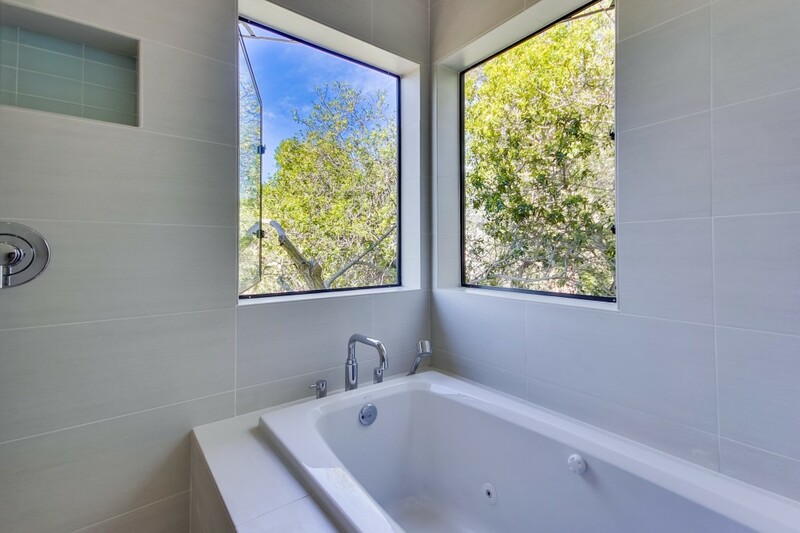 The master bathroom is already ensuite so this project will just get a heavy cosmetic/redesign makeover. It was an obvious decision to take this project into more of a modern direction. 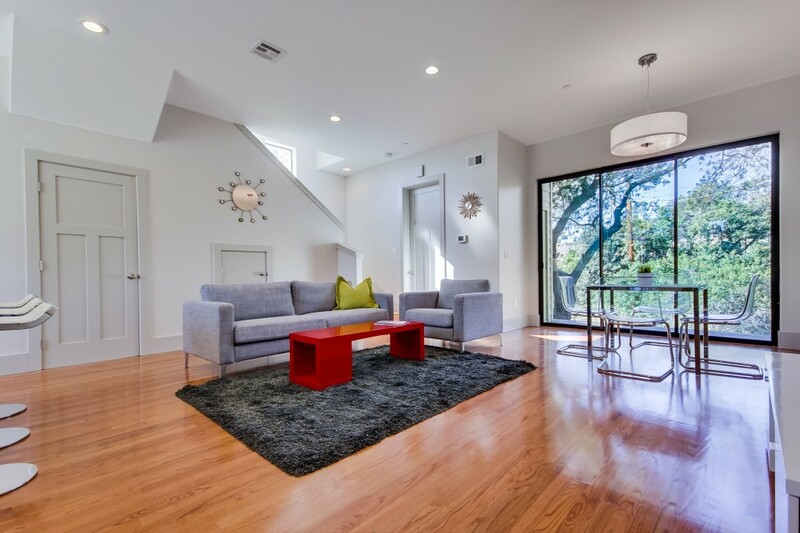 Check out this before and after of the house flip below. 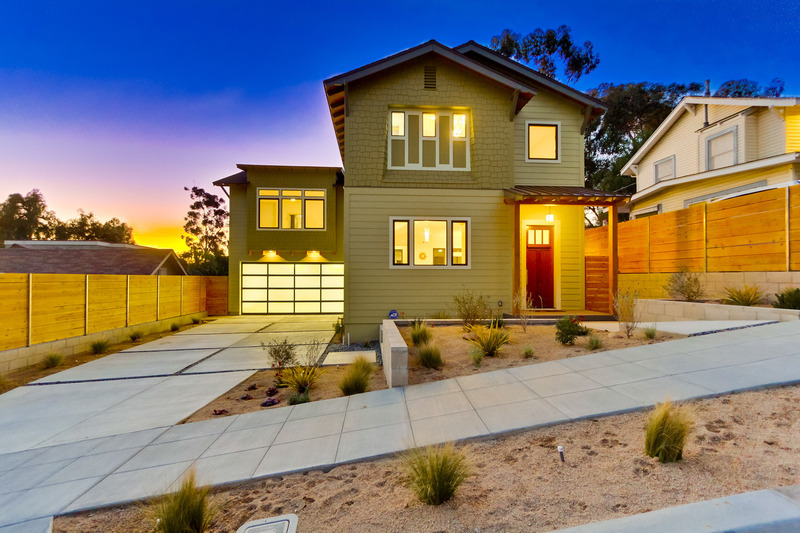 The house next door to this property already has a grey color scheme, so as not to compete with it I am going all white and clean with some warm horizontal wood accents on the fence and garage face. 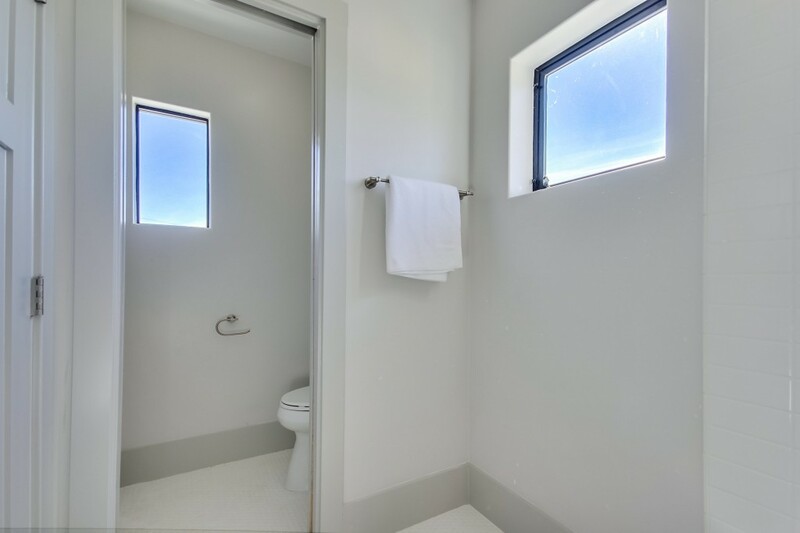 The bathroom windows will get changed to Awning style windows and I am using my favorite Teal color for an accent pop on the front door. 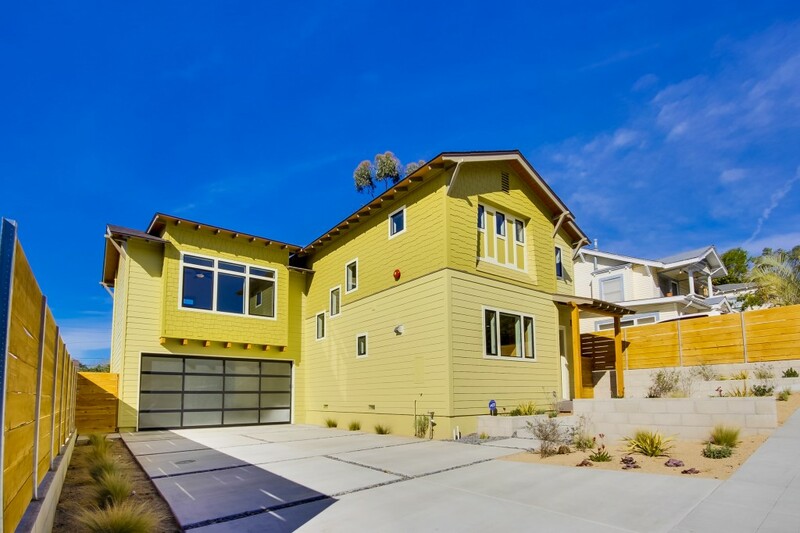 There is already a lot of modern stuff in Imperial Beach so this will work well. 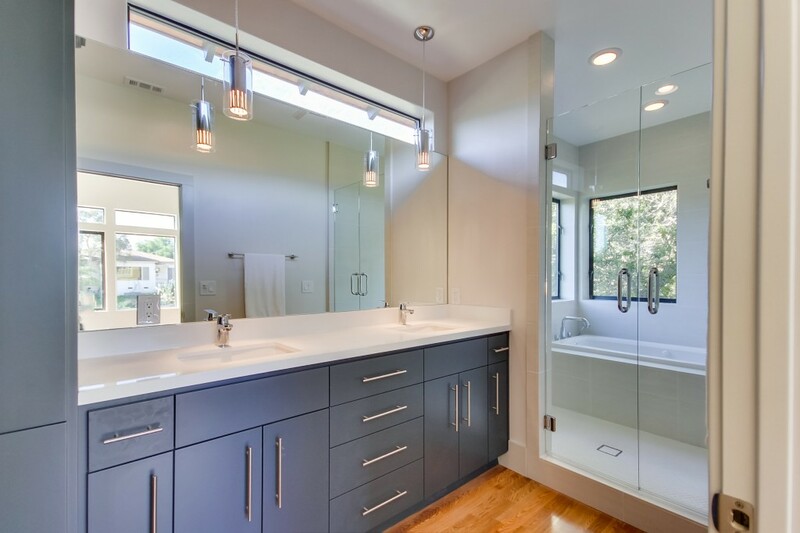 This project is very similar in design to the Clairemont Flip we did this summer. I am very excited at both of these upcoming projects and to be able to roll into 2018 with some momentum. Stay tuned for some updates as we get started in a few weeks on the first house! 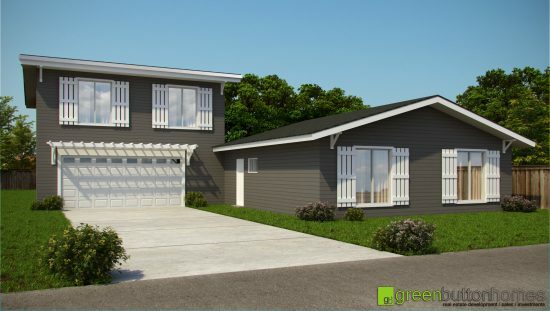 Our New Construction Modern Bungalow in South Park is finally done, 190 days since I got my plans stamped. 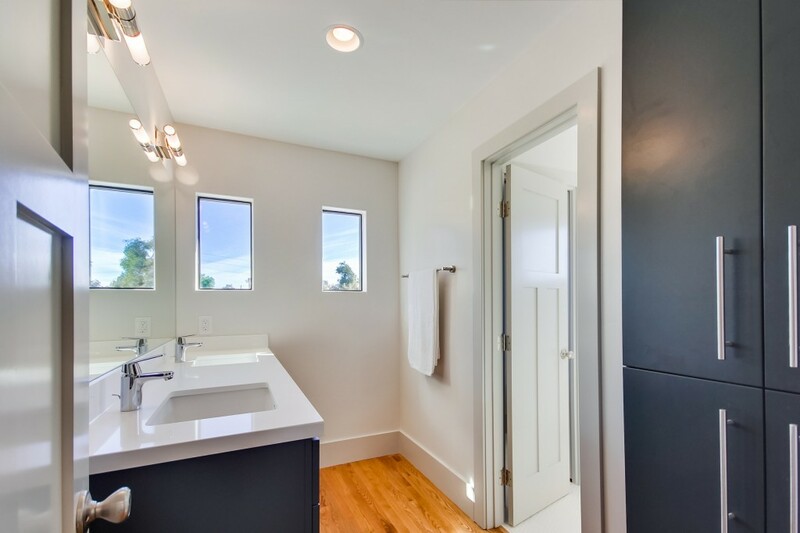 It’s an edgy blend of traditional Craftsman Bungalow style with a Modern influence. We wont be moving in (sorry babe) so it will hit the market this week. 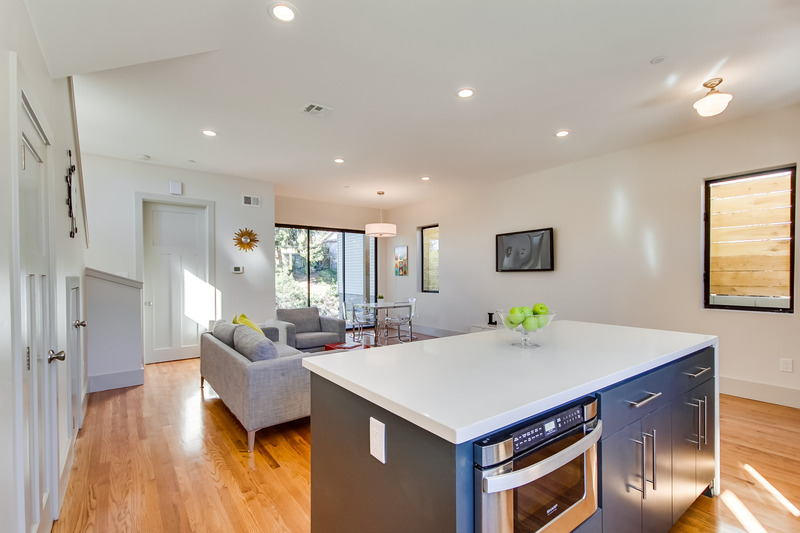 Don’t miss this ultimate urban nest for a hip buyer in the trendy South Park neighborhood! Click here for home details. 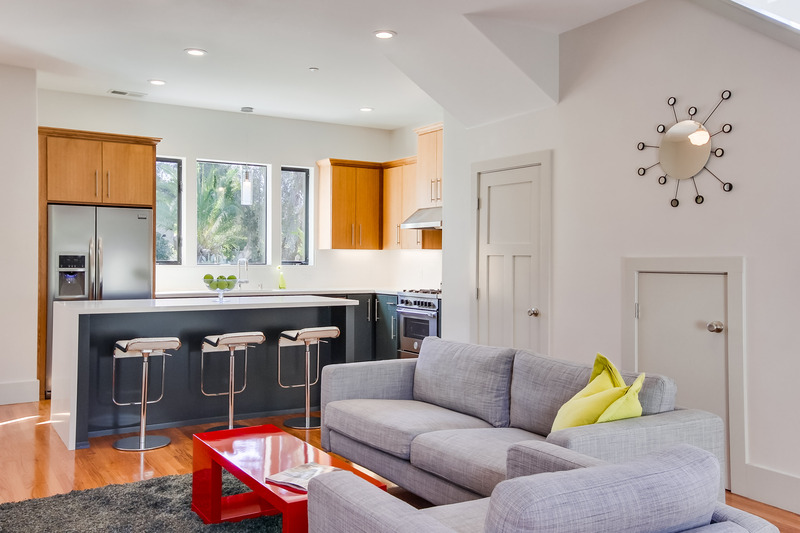 Special thanks to Rancho Photos for the best real estate photos in San Diego! We are still making progress on the Modern Bungalow trying to wrap this house up, but with the holidays its been hard to keep up the pace. Since my last update inside we got the central air conditioning installed, hot water heater, red oak stair treads and risers, and all the electrical trim and fixtures. Custom tile job. The fire sprinkler guy came back and trimmed out too, installing all the sprinkler heads and bell box. There’s nothing left inside except for the tile setting while I wait for another week for the cabinets to arrive and get installed. 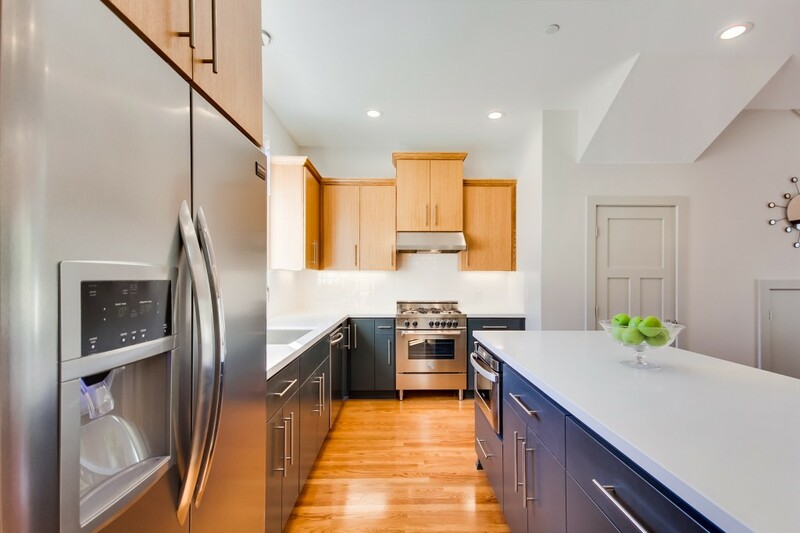 The countertop fabricator is on standby to come right in after the cabinets, then its only hardwood floor refinishing and carpet in the 2 bedrooms. Garage door is also on order. I could have had it wrapped inside by now if I would have ordered cabinets before the drywall went up. The new tile contractor I hired is done now with mud floating all the walls and getting into tile setting with his wife. This is the second husband and wife team we’ve had on this job, my exterior painters’ wife also was a painter. 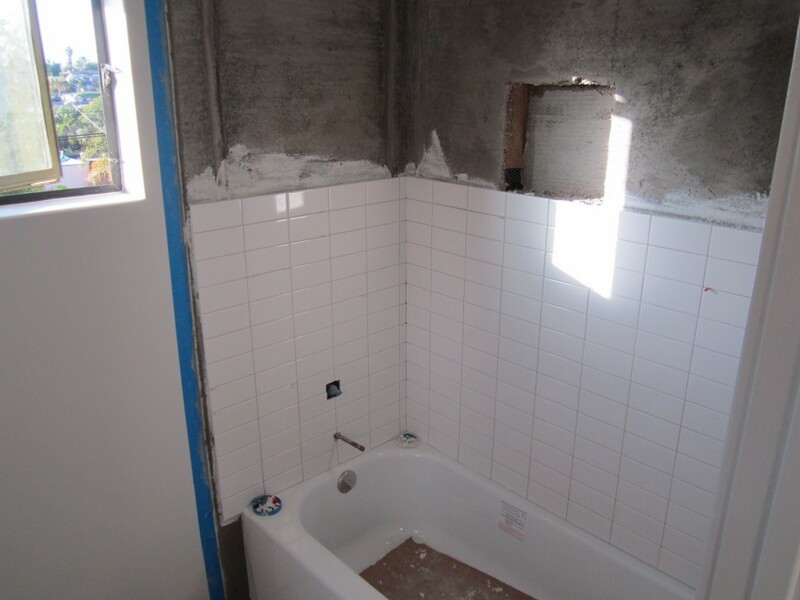 Mud set tile job is the best method and common in San Diego with real tile setters. These ladies know what they are doing too, they are not just sweeping up! Instead of Hardi backer we opted for the mud float method where you do moisture barrier paper, metal lathe and then float out the walls with spec mix. The City comes and inspects paper and lath before you can start floating the walls. Mud set is definitely the way to go. It gives a perfectly flat and plumb surface but definitely more work, he spent 4 days floating the walls with mud when I could have put up Hardi backer board in a few hours. 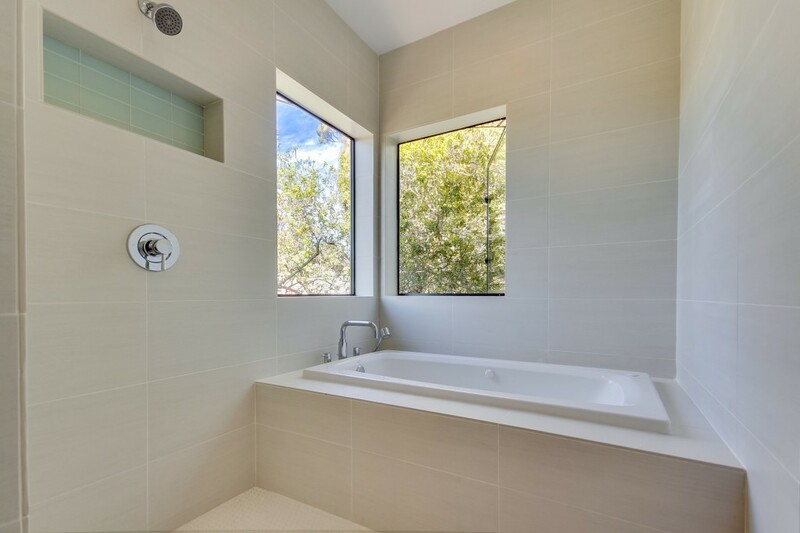 The tile I went with in the master is a modern 12 x 24 light grey designer porcelain and I stacked it square to give a more clean minimalist and contemporary look. In the hall bath I went with the 3x6 ceramic but also opted not do do a subway pattern so it will be more of a clean look with a period material, working well with our home design. 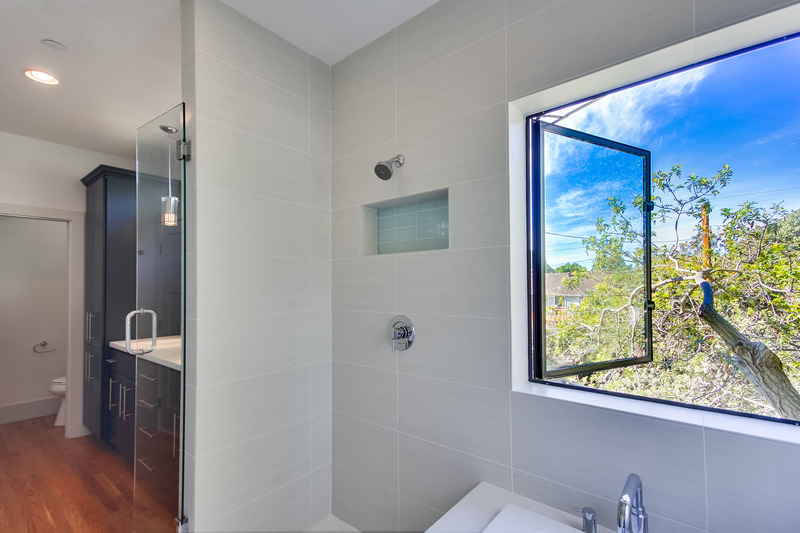 Both bathrooms got great niches in the wall for soap and shampoo bottles. I thought by now I would have been done with the house but things always drag out at then end, time is on my side with Christmas and New Years coming up now so we’ll move in after the holidays. 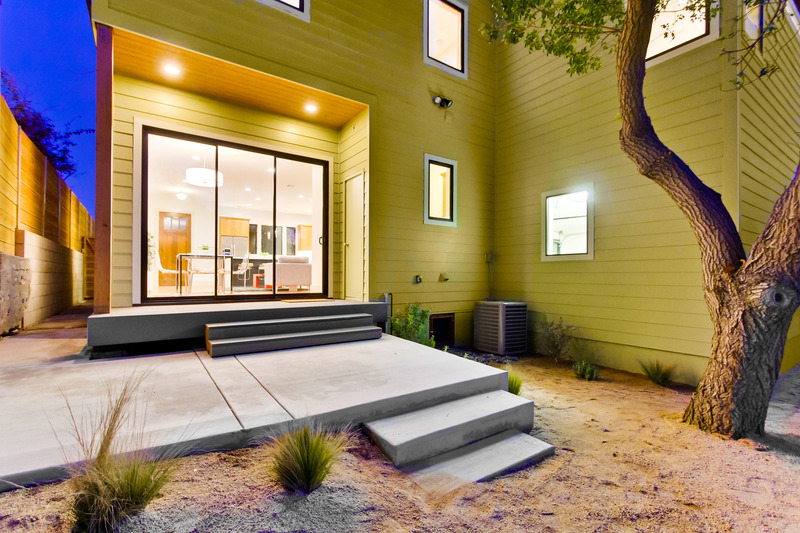 The San Diego real estate market is still very hot. No signs of slowing even through the typically slow Fall season. 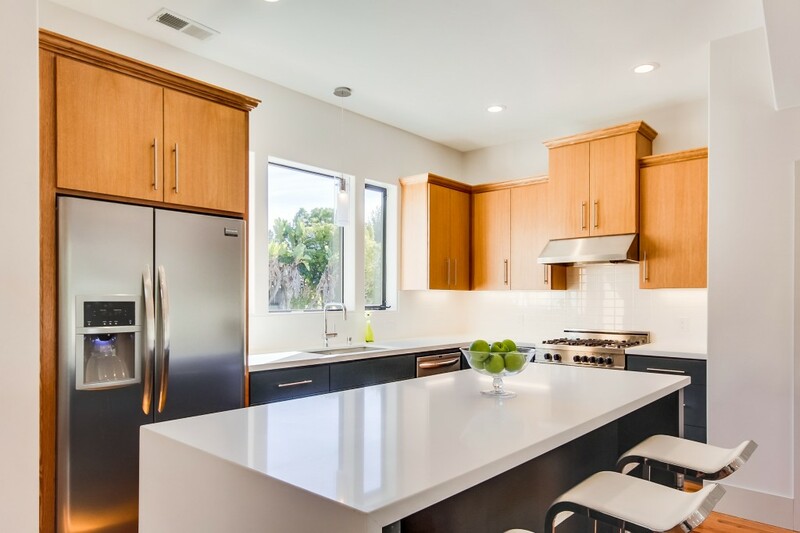 With only a little over 2 months inventory it is a sellers market again and we are seeing bidding wars and multiple offers in all price tiers. I don’t see things changing through 2013 because interest rates will stay low and there’s no more huge waves of foreclosures coming as all the adjustable loans have reset already. Banks will continue to trickle out a few REO’s here and there, but even short sale volume is dropping fast. 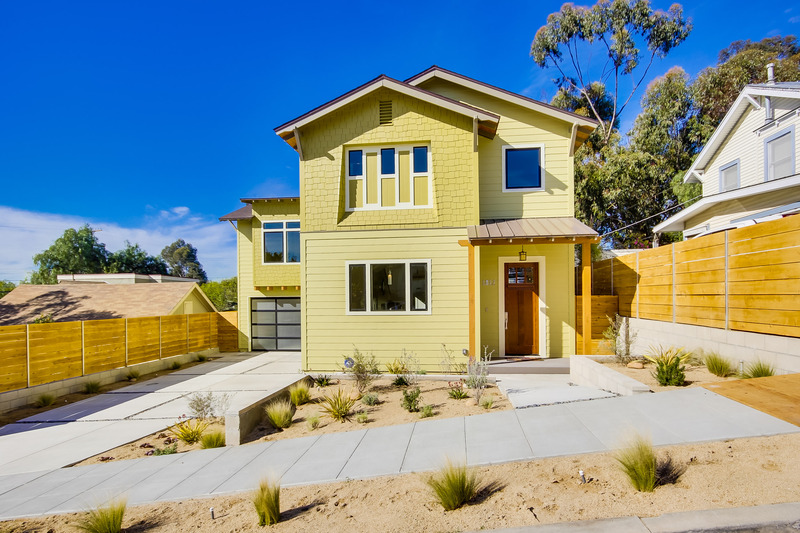 House flippers in San Diego will have a tough time competing with large, well funded buy and hold groups investing for appreciation. Some flippers are moving up the price range and flipping million dollar homes where there is less competition. There’s a lot of investor and first time buyer activity and prices are being affected by it, October was up 13% from last year and in some areas have reached 2005 peak home price levels again. It seems most sub-contractors are having a busy summer. Building is definitely picking up by talking to everyone in the industry. Because of this, my regular electrician couldn’t get to my project right away so I brought in a new crew. These guys are new construction, not messin’ around, real-deal electricians. 5 guys showed up on Saturday and by Sunday at 4pm the whole house was 90% done including 200 amp service, riser, all 24 branch circuits, home runs, under cabinet lighting, multiple 3-way switching and 24 can lights. 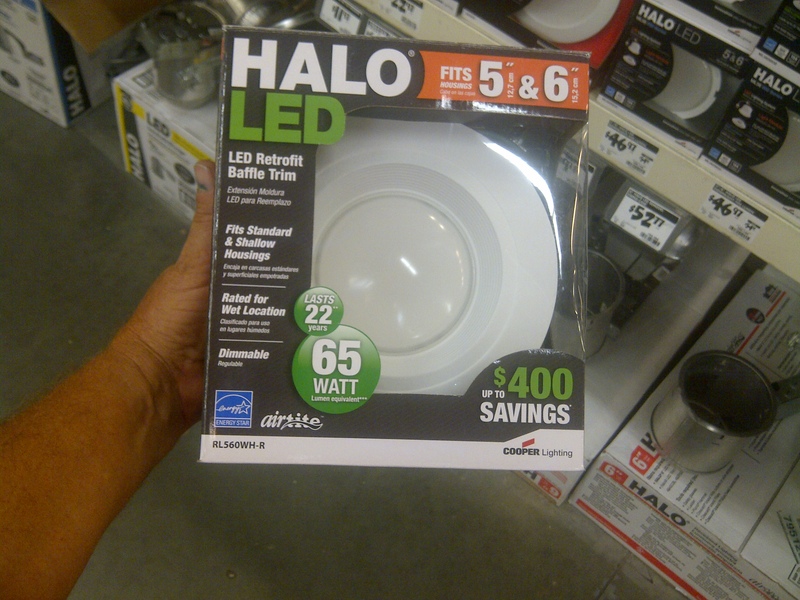 I went with LED recessed lighting for energy savings, having just used it on a customers kitchen remodel I was surprised that the light quality is far superior to the florescent cans we were using last year to conform to Title 24 requirements. 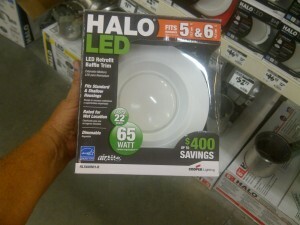 For only 9 watts of power usage you get 65 watts of clean lighting, a huge savings on your electric bill. Just another green feature on this project. We took the drywall delivery this week, too. I like to get it in the house and stacked in all the rooms ready to go before we close everything up outside. It would have been impossible to carry the 12′ sheets upstairs later so this is essentially planning ahead. 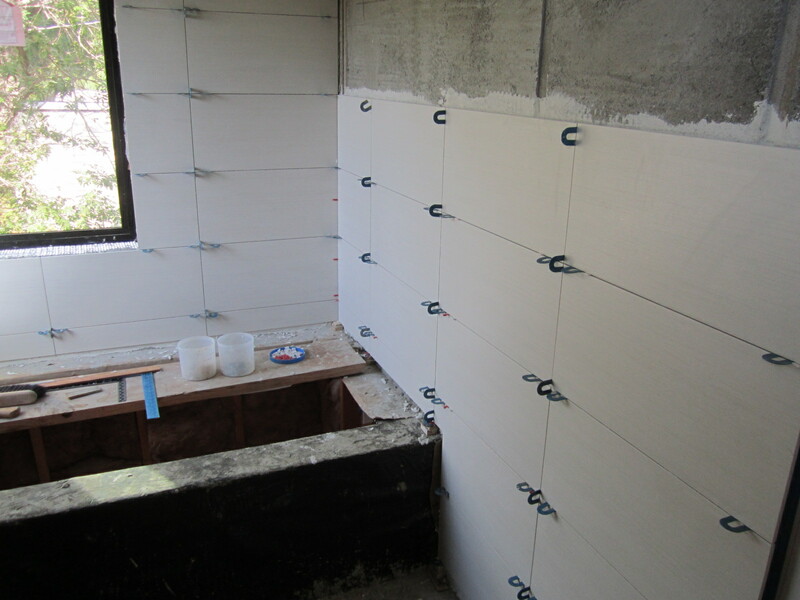 I measured 160 12′ 1/2″ sheets of drywall for the house and 5/8″ for the garage and under the stairwell per City Code. Material cost was $2021.00 not including tape, mud and corner bead. 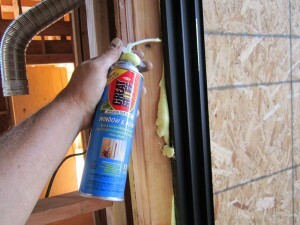 For more energy savings we always foam the doors and windows before drywall. 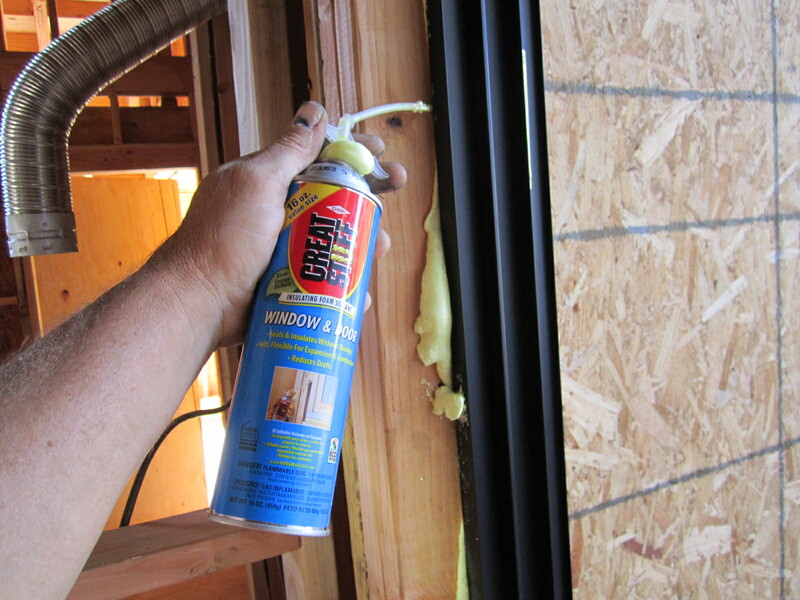 Some guys still wont do this because they think it will warp the window frames, but its the only way to get a complete seal after the new construction windows go in. We learned this in the hot Texas climate. After it dries you just remove the excess that comes out and then you have a great energy seal. 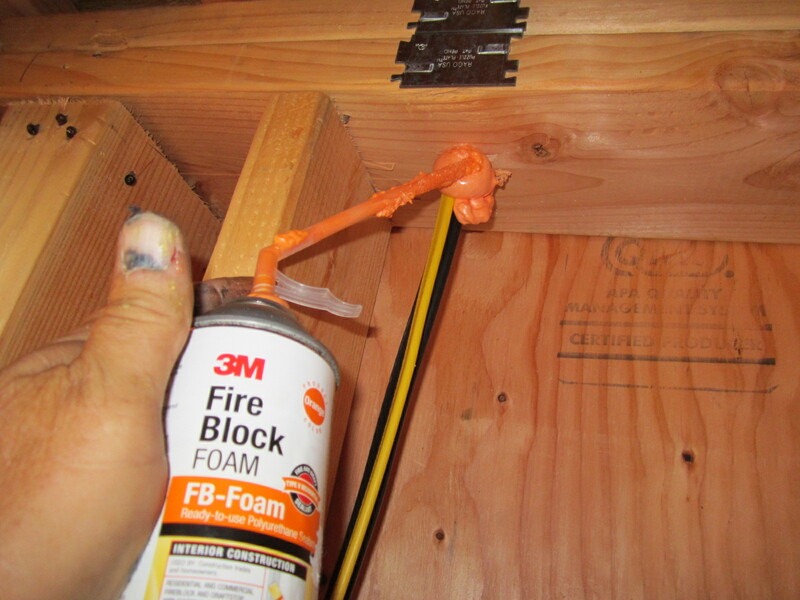 Per Building Code you also have to use the Fire Block foam on all the holes you drilled through the top plate for mechanicals. The inspector will look for this at my insulation inspection. After the electrician was done I brought in my last and final mechanical sub-contractor, the Fire Sprinkler guy. 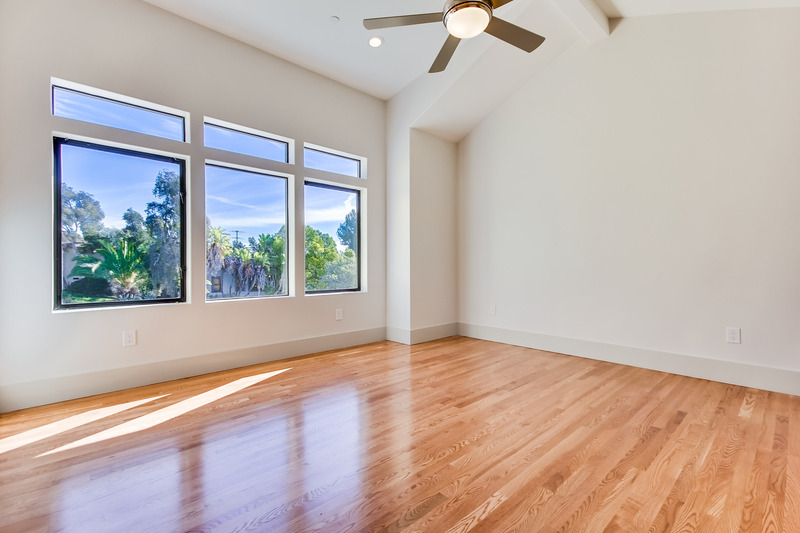 Fire sprinklers on all San Diego residential new construction, and some addition/remodels in fact, has been mandatory since 2007 after we had the big Cedar and Witch Fires. The supply lines come from a panel location near your water service. 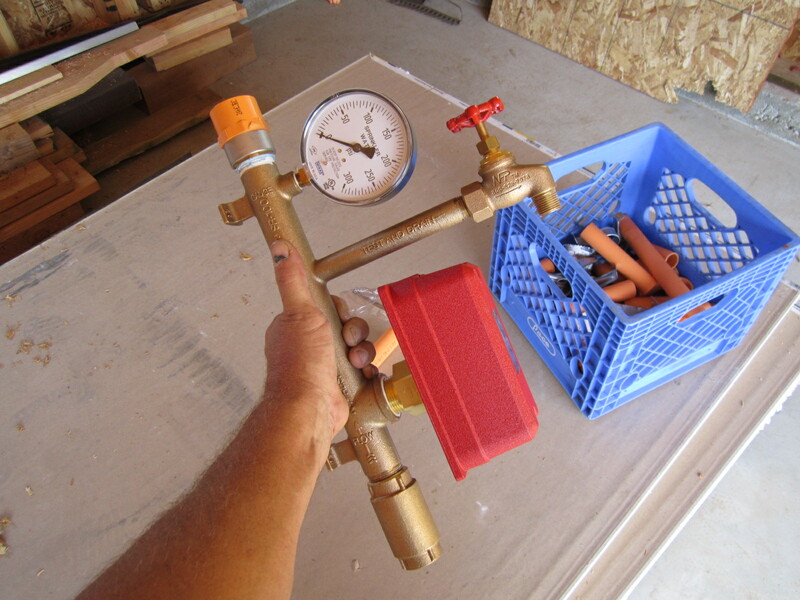 To handle the increased volume, water supply size is stepped up to 1 1/4″ to the house and 1″ at the cut off. 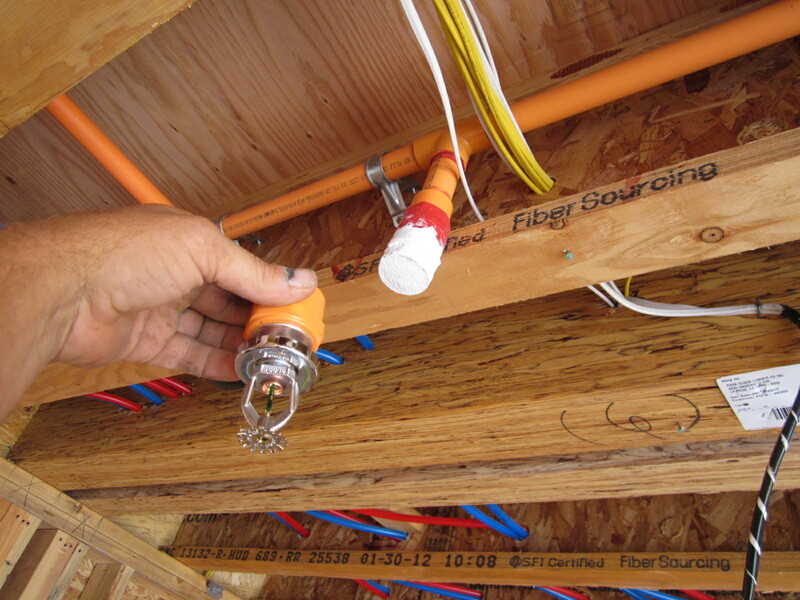 The fire sprinkler lines are 1″ CVPC that is orange in color, its ran throughout the entire house keeping heads around 8 feet apart and away from A/C registers and lighting, and the calculations call for a certain number of sprinkler heads per room size. 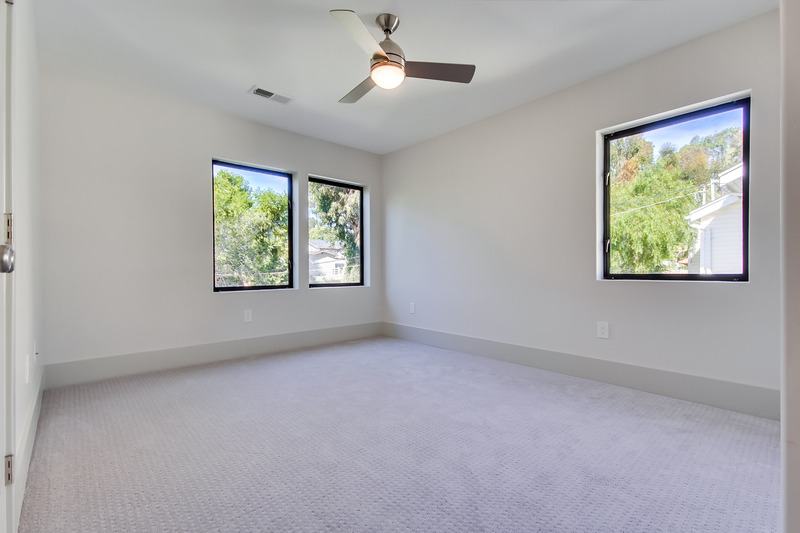 Per his City permitted design, my sub-contractor has 4 heads in the great room, 1 in each bedroom and bathroom, and even 1 in the walk-in closet, water heater closet and HVAC closet. The master bedroom got 2 heads. 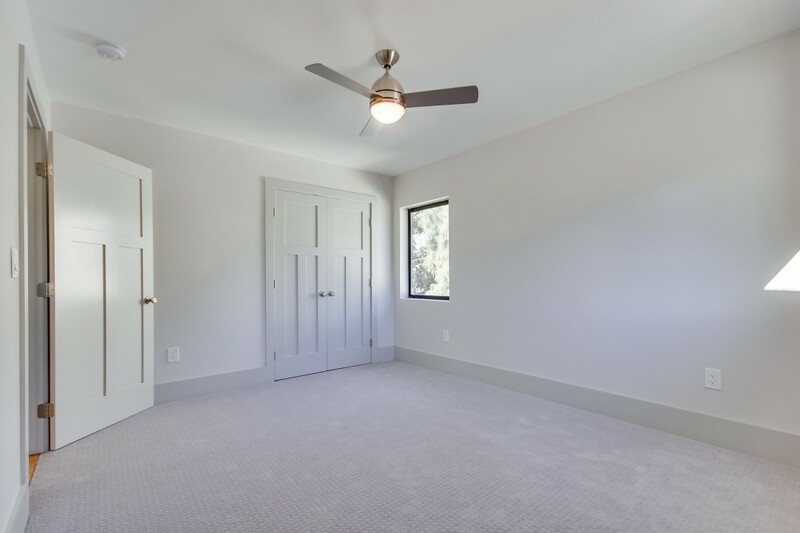 The fire sprinkler heads will not be visible in the living areas and look like flush mounted white discs after trim out. 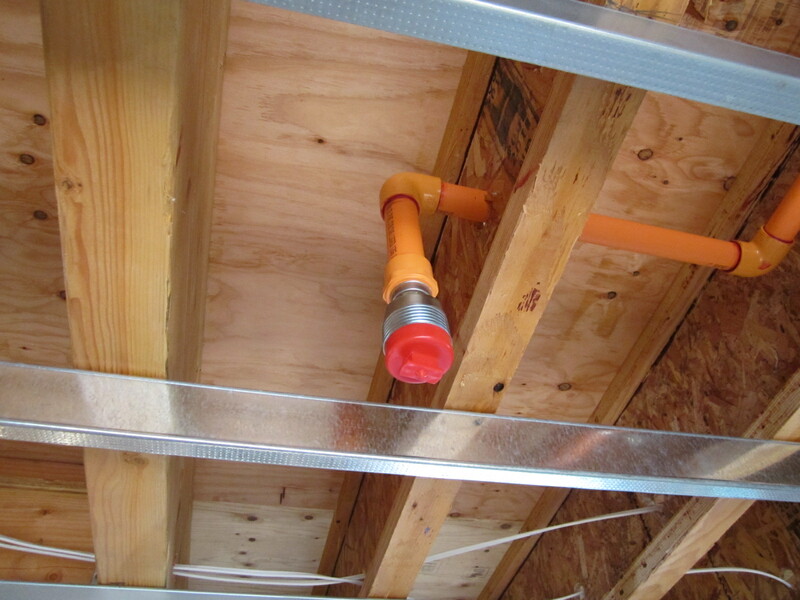 The fire sprinklers in the garage go by different calculations and are a bit different, visible sprinkler heads will be in place after drywall. The requirement is 1 head for every 150 s.f. of garage space. This is the fire sprinkler riser that is located in a panel accessible from the outside of my house near the water service. 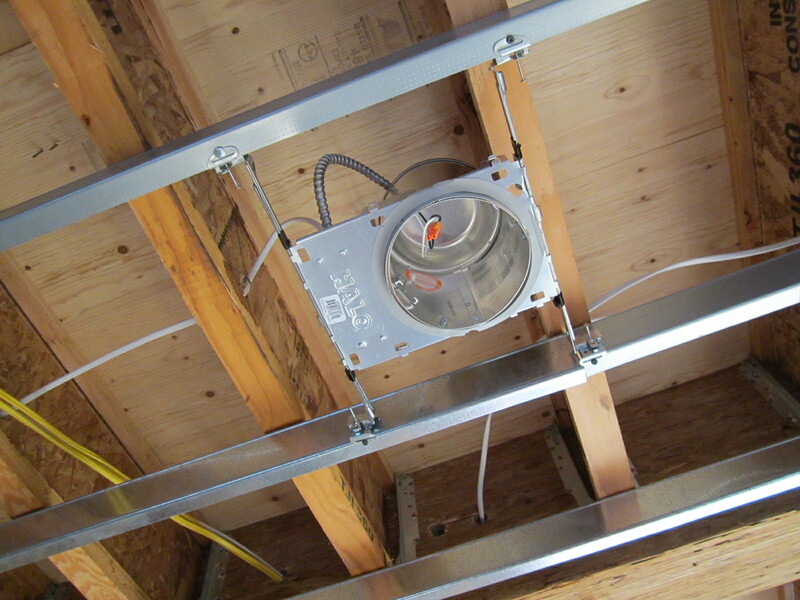 It also feeds the bell box which gets mounted high on the house in an area where bedrooms can hear it easily. Once the system is pressurized with water the Fire Marshall will come inspect it and give me a card, which in turn I will give to the City Inspector at the Frame and Rough inspection this week. 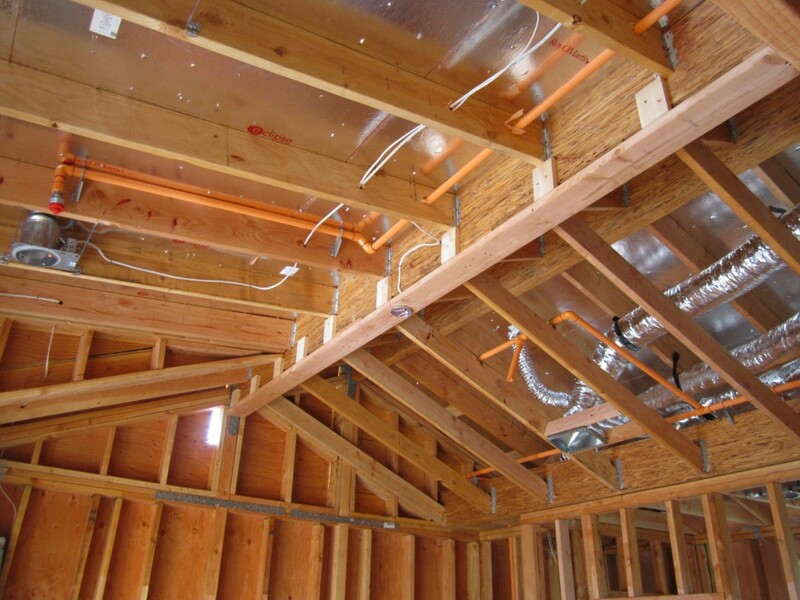 The cost for this complete fire sprinkler system installed, with design and permits was $2,200.00. I’m ready for this big monumental inspection this week, its all going to be downhill after we get to start insulating and hanging drywall, stay tuned! It’s finally done! 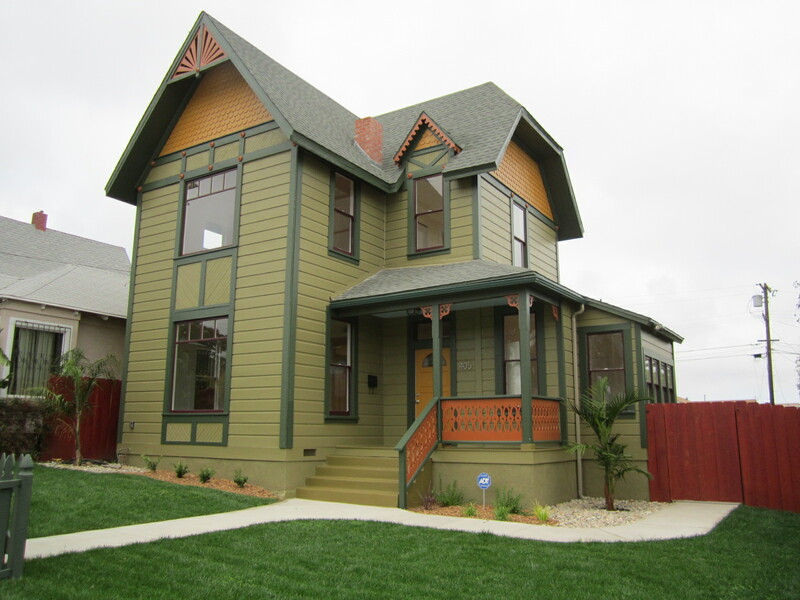 Green Button Homes presents: “The Painted Lady” for $499k, she’s a 5 bedroom, 2.5 bath, 2044 s.f. 1909 Victorian Gingerbread that we totally restored over the summer. 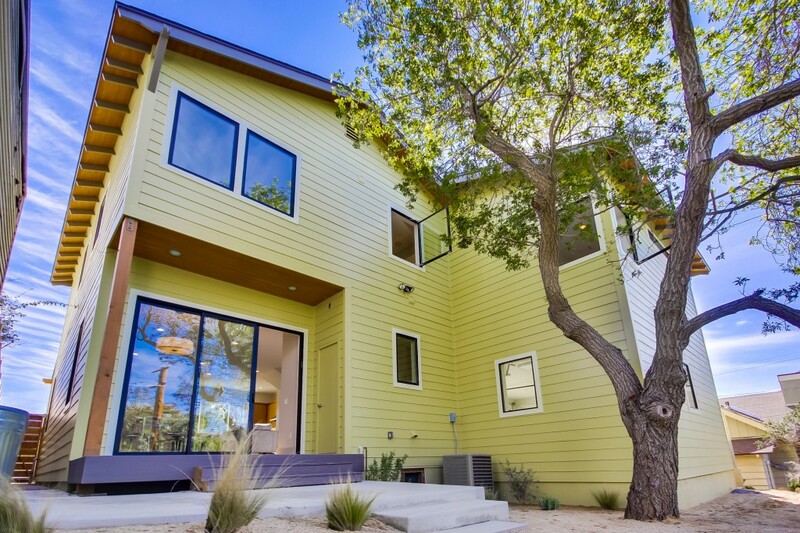 There’s nothing like this property in San Diego right now on the market for the price. I’m having an Open House this Sunday October 23rd from 1-3 pm. If you are in the market or just want to see the Painted Lady please feel free to stop by after the Charger game. The address is 405 27th Street 92102 in Historic Grant Hill Park. 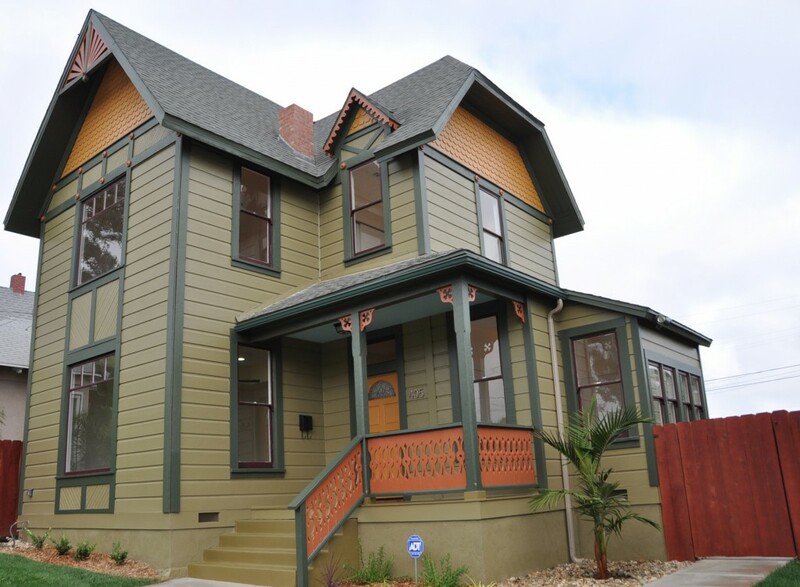 Here’s a walk through video of the Painted Lady from Jim The Realtor, he’ll also be onsite Sunday to assist any potential buyers. I’ll post more pics, back stories on the property and a before and after video soon. *Realtors, we are showing this fine property by appointment only. There is no lock box onsite. 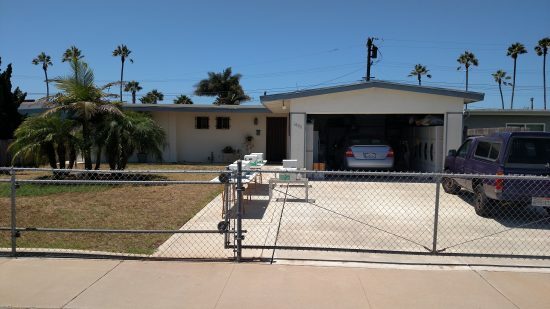 If you have a buyer and want to schedule a showing please call Jim Klinge (760) 434-5000 or myself at (619) 565-7475. See ya Sunday!